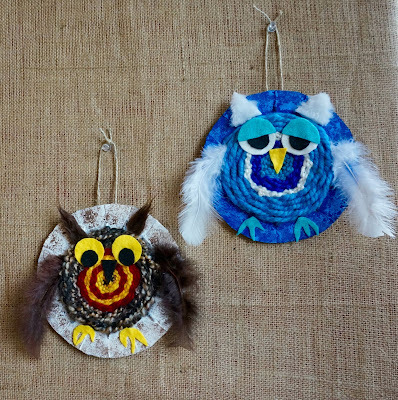 I thought I would feature some textile work this week....first up these woven owls. I like these owls as you only have to do 1 round and you can work larger. 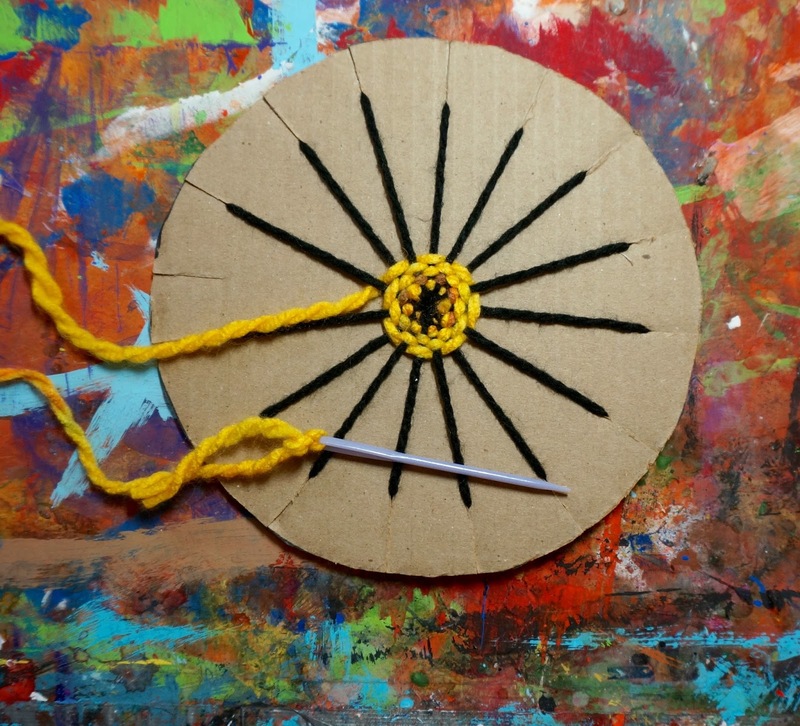 If you haven't tried weaving in the round it is a good starter project with younger grades (Grade 1-3). I'll give you the full owl tutorial in a minute. This week's giveaway is brought to you by Weavy Loops. I was recently asked to give this kit a try. It comes in a large box and it's more of a macrame knotting type weaving. Inside this is what you get as well as an instruction sheet. The best parts are those 2 purple items. 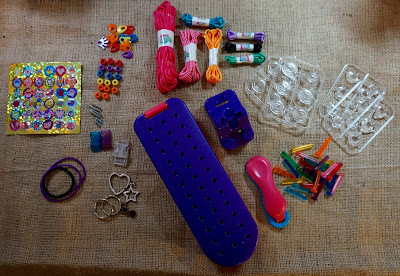 The large pegboard (beginners) and the smaller anchor (advanced) which has a wonderful suction cup on the back. You use this smaller purple anchor to hold your yarn or string lengths while you are weaving and knotting. The suction cup helps hold it securely and lets you weave long strands. You could attach it to the wall or window. Great to use when travelling. The pegboard itself is ingenious in teaching kids macrame. 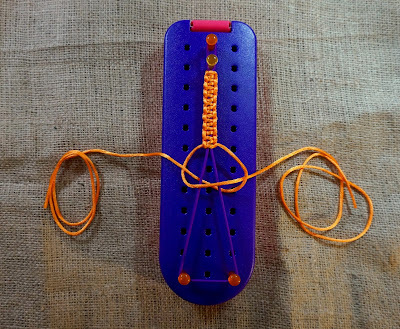 You can set the pegs to correspond to where the loops need to be to make the knots. As I worked with it I was thinking of all the ways I could adapt this in the classroom. 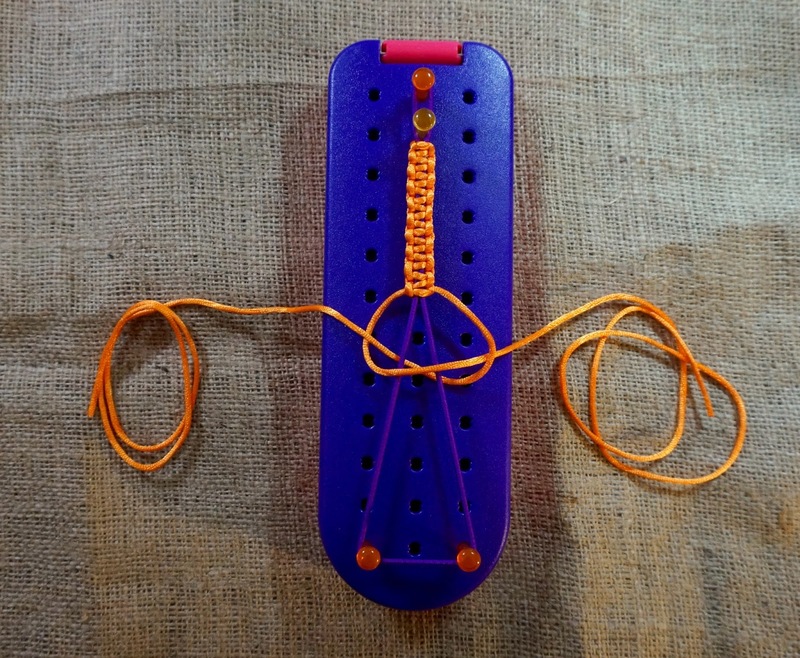 When I teach macrame I use different coloured yarn strands to help the kids sequence the knots but I think a peg or pin board would make it even easier to follow. Inside the pegboard you have storage for the pins and fasteners. That pink tab allows you angle the pegboard up to make weaving easier. There are a few videos on the Weavy Loops website to help get you going and this is a great kit to get you started. I have 2 of these kits to giveaway. 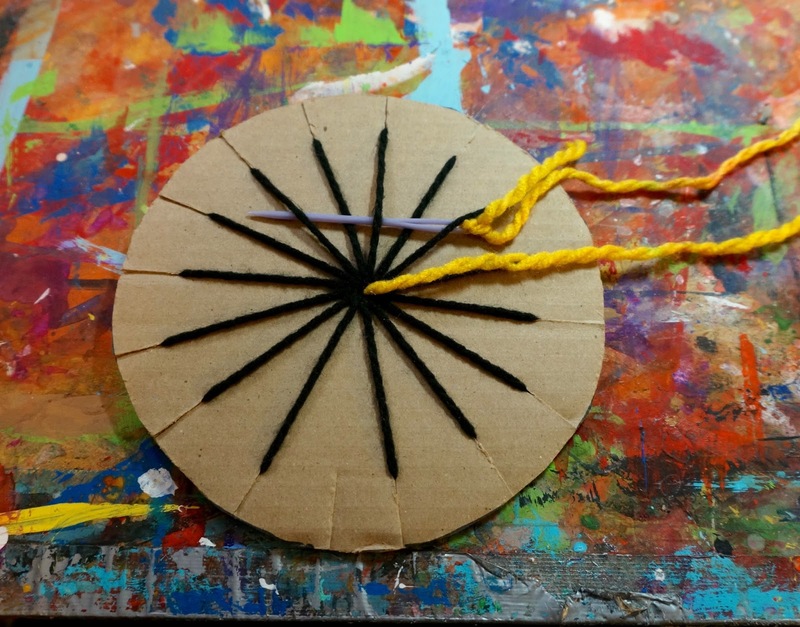 The first thing you need to do is make the circular loom. You want a nice big circle. 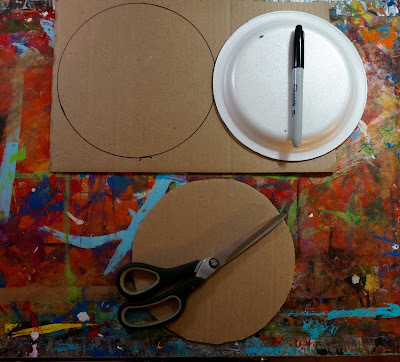 I used a dessert plate and traced around it to get my circle. Now if you are not up to cutting out all these circles for a class set you can also use a Chinet type plate. Something a bit heavy-duty. I do not use foam plates to weave on because they are hard to paint when it comes time to finish them. 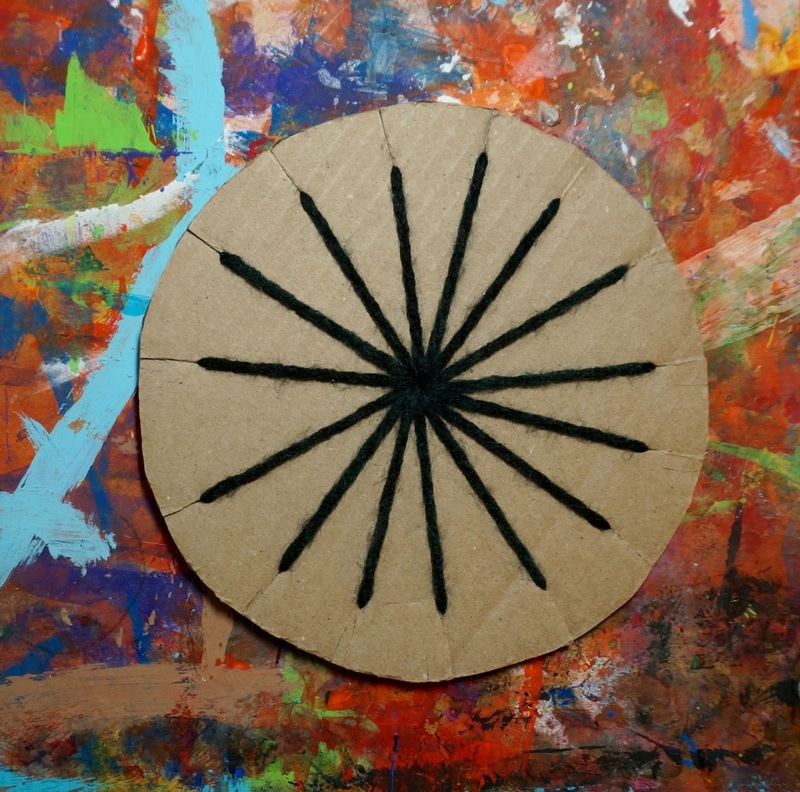 When you have your circle cut out you want to poke a hole in the middle. I use an old knitting needle to do this. 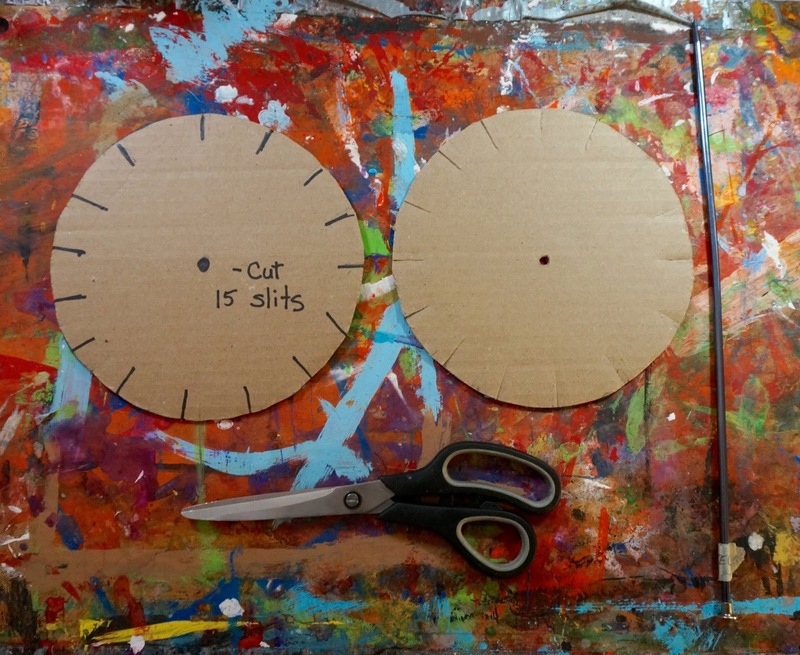 You then need to make 15 slits around the perimeter. 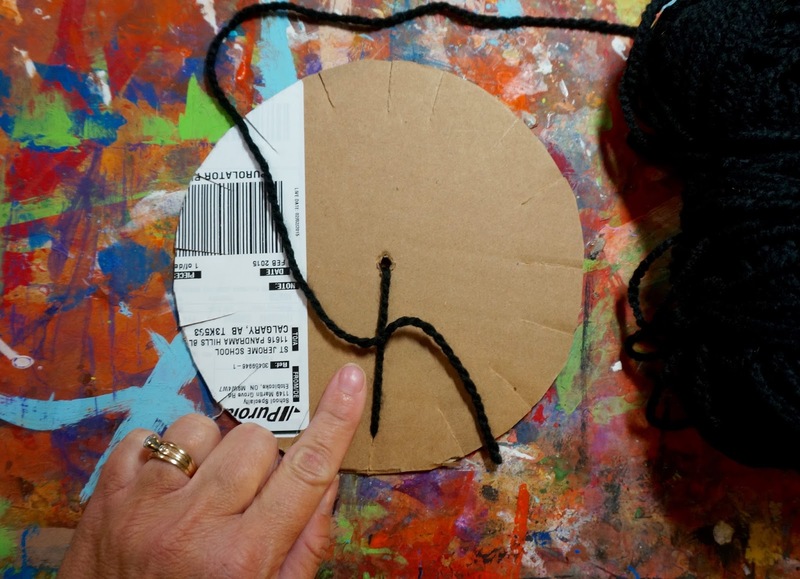 When weaving in the round we always want an odd number. Try to make them as equal as possible but they do not have to be perfect. I just eyeball it, I don't measure. Time to string the loom. 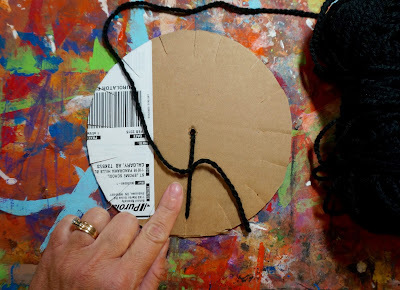 Take a long piece of yarn, about 3 and a half arm lengths, and push one end thru the hole in the middle. Pick any slit and put the yarn thru it and then tie the yarn to itself. This will be the back of your loom. Take the other end of the yarn and tread your yarn needle. If you do not have a needle you can use a toothpick, just tape the end of the yarn to it. I always knot the yarn onto the needle with kids, otherwise we spend way too much time re-threading needles. Using your needle pass the yarn thru the next slit, around to the front and then thru the hole in the centre. Keep doing this until you have threaded all 15. On the last one knot off your yarn where you first tied it on at the back. I can't believe when I was first taught weaving in the round we used to knot each one of those strings separately.....what were we thinking? The front of your loom should look like this. Now we are going to start weaving. Select the colour you want to start with and cut a strand about an arm's length of so.....depends how many colours you want to use. Knot it on to you needle....tie the other end on to the back of the loom and then push the needle thru the centre pulling all that coloured yarn thru. I teach the kids the pattern....I get them to chant over,under,over,under a few times. We start doing one at a time but I show them how they can do 4 or 5 at time. They have to pull the yarn all the way thru but not tight....just enough so it's sitting where it should. Keep weaving, pulling as you go just enough to get it to lie flat. Kids will have a tendency to pull tight....this will just cause the weaving to build up in the center and it will not fill the round. When you run out of yarn or want to change colour tie the ends of the 2 yarns together. 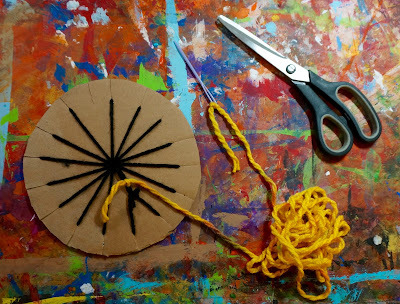 Do not cut the ends of the yarn too short . 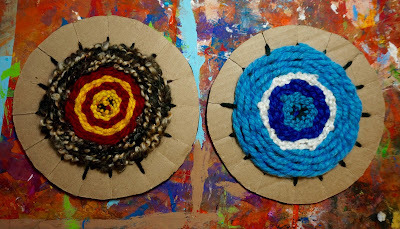 I find it looks neater to just stuff them under the weaving you have completed...it hides the knot. Continue weaving until you reach the limit on the loom. Tie the yarn to the loom at the back, just pull it thru the slit to the back and knot off. 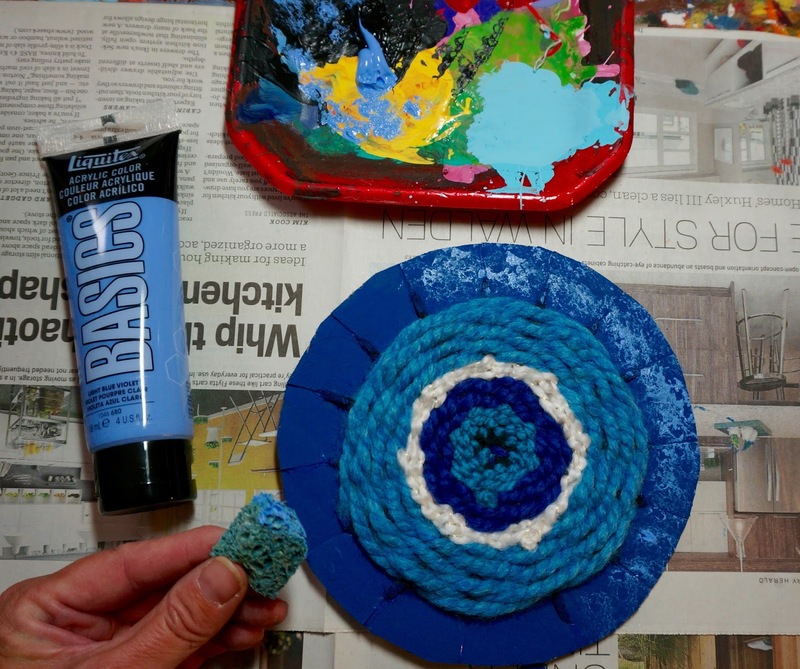 With acrylic or tempera, paint the exposed part of the loom. When I was first designing this owl I figured the loom would be part of the body so I painted it as such. After attaching the feet and wings I think it looks better as the background so paint it a contrasting colour. You could also paint it blue for the sky or green for the tree. I sponged on some paint just to give it some texture. With felt, fabric, and/or fun fur cut out eyes, beaks, feet and ear tufts. 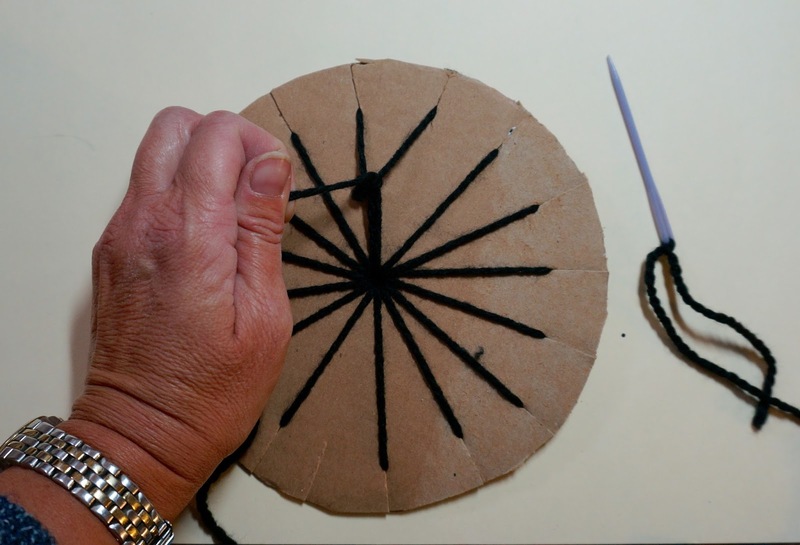 Glue into place on the weaving. I like ear tufts on my owls as the Great Horned Owl is my favourite...also the provincial bird of Alberta! Glue on 2 feathers for the wings. I tied a yarn loop to the loom at the top for hanging. That's it. What a great project for the Fall bulletin board. Don't forget to enter the Weavy Loops giveaway. 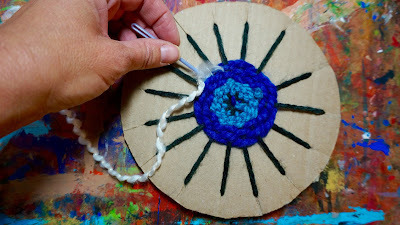 I have another weaving project for you Thursday, see you then. Love this! We'll try this one for sure. We would just pin them to our knees while knotting and pin them to our shirt when not in use. I like the idea of the loom to help students learn the process. I love ALL your art inspirations! I will definitely do this with my students this year. 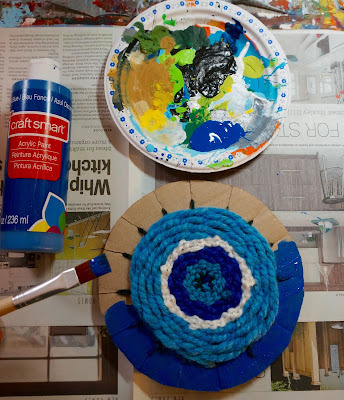 We tried circle weaving last year and my fifth graders loved the process- but at the end it was tough to come up with a way to wrap it up that made a good looking finished product. Most kids used the weavings as the center of a flower (except one kid who turned his into a bloody eyeball...) but it wasn't a total crowd-pleaser. I think owls will appeal across the board. Plus, I have a boatload of earth-toned yarns that the kids seldom gravitate towards, so plenty of materials on hand to do this with them. Thanks for a fun and fresh idea! I would really like to win this for my soon to be 7-year-old daughter. My 11-year-old daughter and I would love to try the Weavy Loops. Thanks for the fun giveaway! Gail! 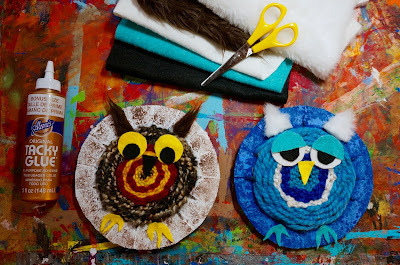 These are adorable and thank-you once again for your step by step instructions with pictures. 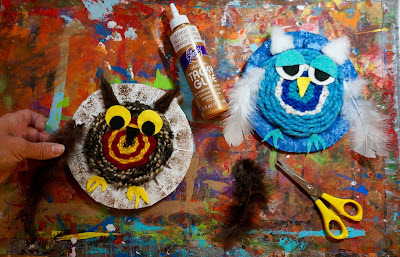 My grades ones tried weaving last with construction paper and sewing using the blanket stitch, so this is a great next step, AND, we are going to study the beautiful Great Horned Owl, too! Who! Who! Hello! This is my first time finding your blog. Thank you for this adorable idea! I was a public school art teacher and am now teaching in a Christian school with a MUCH smaller budget. :P. I would truly appreciate the Weavy Loops, and would consider purchasing additional ones for classroom use. Thank you! I love the Woven Owls and Weavy Loops! 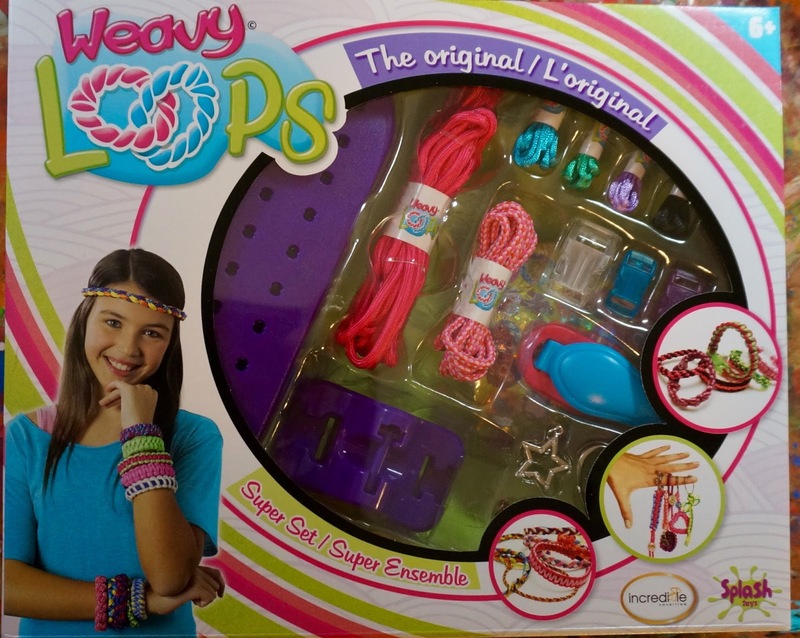 I would love to try out Weavy Loops! Thanks for all of the great art inspiration! I've been looking for an owl project to try with the kids. Do you think grade two's could do this? I think Grade 2's can handle this project. 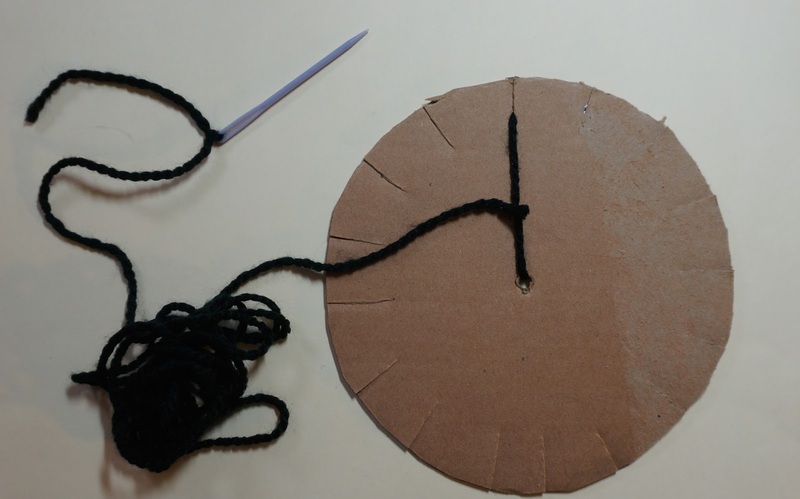 I would give the kids a little tutorial on threading a needle and tying a knot. 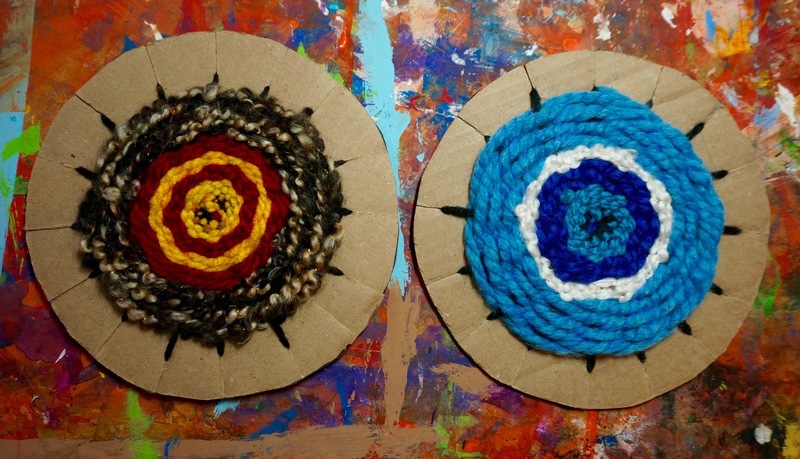 Before we start a weaving project I go over these 2 skills, even with Grade 6. 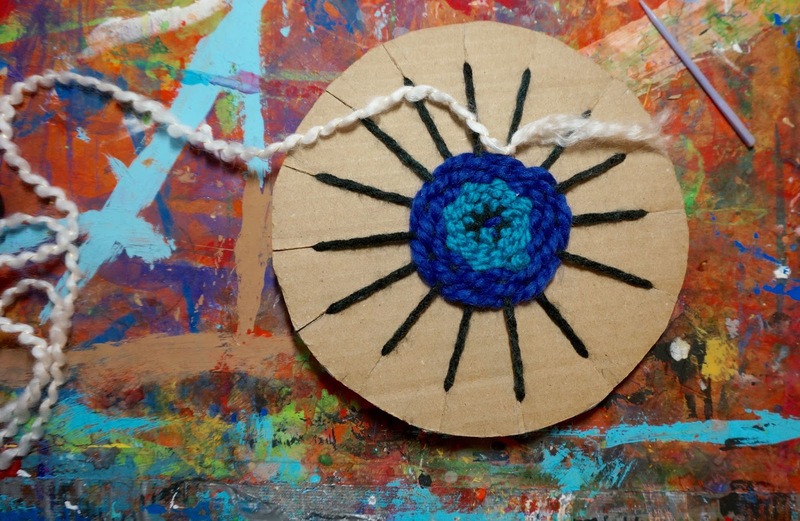 So exciting to see a new weaving idea. I can't wait to share this with my colleagues and give it a try with my students. The weaving loops look really interesting. i had discovered those, yet.